The Cynosure Apogee Elite is a superior system compared to most currently available devices in the market. This system provides safe, fast, and effective treatment for hair removal and a variety of skin issues including age spots, freckles, sun spots and spider veins. The Cynosure Apogee Elite benefits practitioners and clients alike. Better control and adjustable sizes allow for easier, less painful treatment which results in happier clients. Results are also fast and permanent. Within three treatments, your client will have considerable amounts of hair permanently removed. The Cynosure Apogee Elite combines two wavelengths in one system to allow the user to work with a wide variety of skin colors and issues. The 1064 nm Nd:YAG laser penetrates deep for hiding spider veins and is the most effective laser for deep skin spots. The Alexandrite laser’s high melanin absorption allows for painless, safe hair removal. Buying the Cynosure Apogee Elite will allow you to expand your business and will thrill your customers. This fast, safe system is effective and easy to use. It is a benefit to any practice and does the work of two systems in one. There is a high demand for permanent hair removal and many people are constantly looking for the safest method with the least amount of pain. The Cynosure Apogee Elite is the perfect machine for this. If you are looking for an amazing permanent hair removal product, then this product is perfect for your practice. 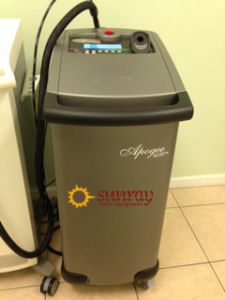 Sunraylaser.com offers the best price for the Cynosure Apogee Elite, feel free to send us a message and we will get back to you right away.